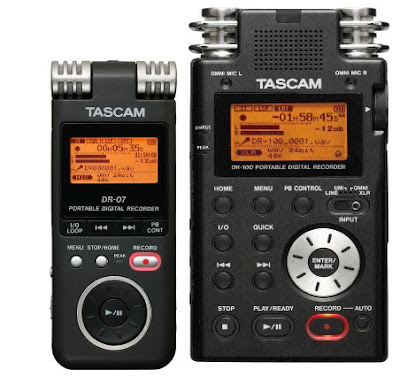 Tascam is expected to launch two new digital audio recorders within the next few months. The Tascam DR07 is a smaller recorder that will retail for around $199 and go head to head with the Zoom H2, while the Tascam DR100, which features XLR inputs and some more advanced features will sell for around $450. The DR100 will support 48V phantom power, has a built in monitor speaker, and runs on 2 AA batteries. It also has four built in microphones, two uni-directional stereo mics for high quality recordings and two omni-directional mics for “minutes recording.” Like the Sony PCM-D50, the Tascam DR100 will have a pre-recording featue that will let you set up the recorder in pause/record mode and actually start the recording a few seconds before you deselect the pause button. There’s also a record delay option that lets you start a recording a few seconds after you hit the record key. The Tascam DR07 has built in stereo mics, runs on 2 AA batteries, and like the DR1000 it records and plays MP3 and WAV files. It has 3.5mm mic and line inputs. Each recorder comes with a 2GB SD card, at least if you order from Sound Professionals, one of the few sites that currently has product pages for these new devices. via Tapers Section thanks Charles! Tascam DR-100. Is about time someone brought out a simple, plain, but high quality digi audio recorder with inbuilt mic’s thats perfect for journalists! DR-100 Firmware Update 1.1 available. The German tascam-site (www.tascam.de) has now released the V 1.1 Update of the DR-100. Beside the new 96kHz capability, there also is a small service-update that adresses some noise problems. This kind of products doesn´t come to my country so i took the risk to buy it without make a few tests before buy it. It was a mistake, i have a Sony minidisc(mz-rh1), with Sony ecm-ms907 stereo condenser mic, and i made a comparation between products and the result was that minidisc is much better to get better sounds from live recordings, in every kind of stage or theatre. I made recordings in operas with minidisc and the voices sounds like the singers were singing by your side. The Tascm dr-100 take much more effort to get a strong mic or line input signal, so you need a louder signal to get a good recording, using all the parameters at the top, but if you use the mic imput volume at the top and the mic gain in high, you´ll get much more noice, and maybe a lot of peak if the signal is stronger than the tascam can get or stand, so you have to use the auto limiter and then the sound quality gets worse with this analog parameter. There is no difference between recordings mp3 320kb in 41khz, 48khz,etc. and wave 16bits, 24bits, in 41,48khz. all sound the same, the only difference is wave recordings get much more room in your sd card. The new tascam software to make recordings in 96khz is really bad, with the recordings apears a lot of noice and the sound quality is really poor, sounds better recording in mp3 than wave at 96khz. So if you want to get good sound from the live concerts, or any kind of live sound, tascam dr-100 is not a good option and is very expensive for the piece of plastic that it is. Wow. Mine sounds excellent. The line and mic inputs are very clean. I wouldn't ever use the omni mics for music, the cardioid ones work fine on the unit. They are a tad bass light. A/D conversion is really excellent. Needs a stand, hand-held you get loads of noise. I have a DR-07 and think it's a great recorder for the money. The built-in mics could be a little better, but for $150 or so for the DR-07, what more could you want? The preamp for external mics is surprisingly quiet for a recorder of its calibre. The DR-07 is probably the best of the cheap digital audio recorders.